The Team — BHA Architecture Inc.
As a founding partner of BHA in 1991, Michael brings to the firm more than thirty years of architectural experience in the Lower Mainland, Whistler, the B.C. Interior, Alberta, and California. Prior to the formation of the present firm, Michael was a senior associate with Paul Merrick Architects where he was the project architect for a number of major developments such as CIty Square and Cathedral Place. Michael has been responsible for the conceptual design of many significant projects including the Four Seasons Hotel (Whistler), the Four Seasons Residences (Whistler), the Brittany at Champlain Gardens, the Athlete's Lodge in Whistler, and the Musqueam Community Centre. Michael's focus over the last 20 years encompasses a variety of building types, from Resort Residential to Multi-Family Residential and Mixed-Use Commercial projects. He served on the Whistler Design Panel from 2004 through 2009. Prior to joining BHA in 2001, Scott developed a diverse background, spending 20 years working throughout Western and Central Canada in construction, engineering and architecture. This interprovincial and interdisciplinary experience spans a broad range of project types including resorts, multi-family and single family residential, institutional, commercial and industrial projects giving Scott a wide perspective on the industry. Scott specializes in turning concepts into built form through design development, technical problem solving, consultant coordination and on-site work. He brings professionalism, enthusiasm and a firm commitment to high quality service to every project. Peter began his career in architecture in the Interior of British Columbia, working on large institutional projects ranging from Okanagan College to a variety of School District facilities. After moving to Vancouver in 1987, Peter spent several years in construction and project management, before co-founding and managing Resolve Software Solutions Inc., a Vancouver-based software company, servicing the technology needs of the design community. After 10 years of developing CAD software solutions for architectural clients, Peter re-joined BHA in 2010. 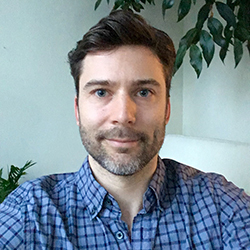 As project director, Peter oversees all aspects of each BHA commission, ensuring that stakeholders are guided through the process with focused attention and mindfulness. This experience provides BHA and their varied clientele with an outstanding end-product – one that is both well-designed and well-constructed. 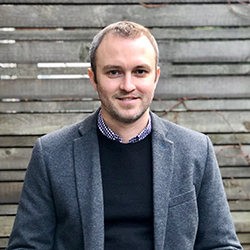 Duff Marrs began his professional practice as a student intern at Burrowes Huggins Architects in 2008, and returned home to BHA as an Associate in 2015. In between, Duff graduated from the Master of Architecture program at Dalhousie University and worked on a variety of institutional and residential buildings while becoming a registered architect at Dialog (formerly Hotson Bakker Boniface Haden). Most notably, Duff spent four years working on the new UBC Student Union Building from the design phase through to construction completion and LEED Platinum certification. At BHA, Duff brings a keen interest in design excellence and sustainability to the office, and strives to apply principles of place-based architecture and sustainable design to every project. Working closely with the rest of the team, Duff helps shape and develop design through the early stages and into working drawings. For Duff, design never stops. After studying art history at UBC, Sascha worked in the Education Department of the Art Gallery of Ontario. Upon returning to Vancouver, she spent a number of years with Costco Wholesale as an administrator and manager, then moved to the UK Division as a buyer for four years. Sascha returned to her hometown of Vancouver in 2002, and joined BHA later that year. Her primary responsibilities include project administration and office management. Dave has acquired a broad range of architectural experience in many different project types. After graduating from Dalhousie University with a Master of Architecture, he began his career with Urban Arts Architecture in 2008, working primarily on cultural and residential projects. These included First Nations community & health centres, museums, libraries, and renovations to post-secondary institutions. Most notably he was project architect for the North Vancouver Museum, to be completed in early 2020. Dave also spent three years with DIALOG Architecture, working on large, multi-unit, mixed-used residential projects where he was responsible for the design, documentation, and construction administration of two high-rise towers in Edmonton, Alberta, with combined construction budgets of $120 million. During his time there, Dave also served as Project Architect for the design of the new Translink Operator’s Facility at the University of British Columbia. Dave joined the BHA team in the Fall of 2018, as an Associate. He is a contributor to all project phases and is enthusiastic about developing beautiful, simple and effective design solutions for our clients.